Ambient DJ President, Gregg Hollmann, had his article "Eureka Moments - Lessons Learned at the DJ Expo" published in the November 2010 issue of DJ Times (www.djtimes.com). This article was one of the cover stories. The article lists takeaways from some of the best seminars of the DJ Expo given by the likes of Steve Moody, Jason Jani, Jason Canaan, Peter Merry and the Wedding All-Star Team (MC Johnny K., Adam Weitz, Mike Walter, Mike Berrios, Elisabeth Scott-Daley and Big Daddy Sean McKee). I will provide the link to the article when the online version becomes available. 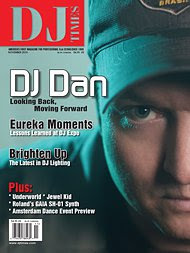 Big shout-out to DJ Times for publishing my article and comping my DJ Expo fees for 2011! For those of you who don't subscribe to DJ Times or attend the annual International DJ Expo in Atlantic City, what are you waiting for? Please follow us on Twitter at AmbientDJs. Have You Booked Your Holiday Party Yet?